Palestinian officials have said they are planning to sue Britain over the 1917 Balfour Declaration that laid out a vision for a Jewish homeland in Palestine. Palestinian FM Riad Malki said the document led to mass Jewish immigration to British Mandate Palestine "at the expense of our Palestinian people". Mr Malki said the lawsuit would be filed in an international court. Israel declared its independence in 1948 after the UK mandate expired. Speaking at an Arab League summit in Mauritania on Monday, Mr Malki said the UK was responsible for all "Israeli crimes" since the end of the mandate in 1948. "Nearly a century has passed since the issuance of the Balfour Declaration in 1917," he was quoted as saying by the Palestinian Wafa news agency. "And based on this ill-omened promise hundreds of thousands of Jews were moved from Europe and elsewhere to Palestine at the expense of our Palestinian people whose parents and grandparents had lived for thousands of years on the soil of their homeland." The minister did not provide any further details about the planned lawsuit. 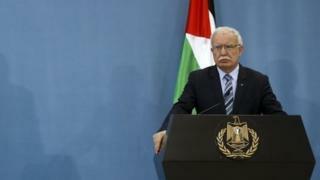 Mr Malki made the announcement on behalf of Palestinian Authority President Mahmoud Abbas, who was not at the summit because of his brother's recent death. The Balfour Declaration, named after then UK Foreign Secretary Lord Arthur Balfour, pledged Britain's support for the establishment "in Palestine of a national home for the Jewish people". The document formed the basis of the British Mandate for Palestine, which was formally approved by the League of Nations in 1922. Jewish immigration to Palestine accelerated from the 1920s to the 1940s, latterly spurred by Nazi persecution and the Holocaust in Europe. The growth of the Jewish population was opposed by Palestine's Arab community, which rejected the eventual establishment of a Jewish state. Britain has not publicly commented on the issue. Israeli Prime Minister Benjamin Netanyahu said the move "will fail, but this shines a light clarifying that the root of the conflict is the [Palestinians'] refusal to recognise a Jewish state in any borders. "It was and remains the heart of this conflict."